We use behavioural insights to design nudges, leveraging social comparison and assignment of responsibility, aimed at reducing electricity consumption in a large provincial government office building with 24 floors, a total of 1008 occupants. Results from a randomized control trial show that floors participating in a treatment with inter-floor competitions and tips reduced energy consumption by 9%, while those that also included floor-wise “energy advocates” reduced energy consumption by 14% over a period of 5 months. 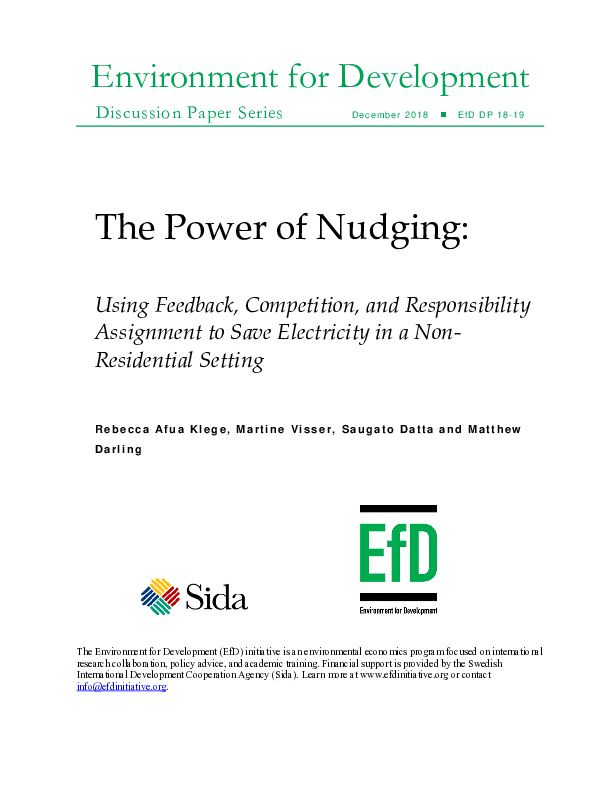 These reductions – which are among the largest demonstrated in any utilities setting – cause us to re-evaluate the conventional wisdom that asserts that it is harder to nudge behaviour in non-residential settings (such as office buildings) where users do not face the financial consequences of their behaviour than it is in residential settings, where they benefit financially from conservation efforts.